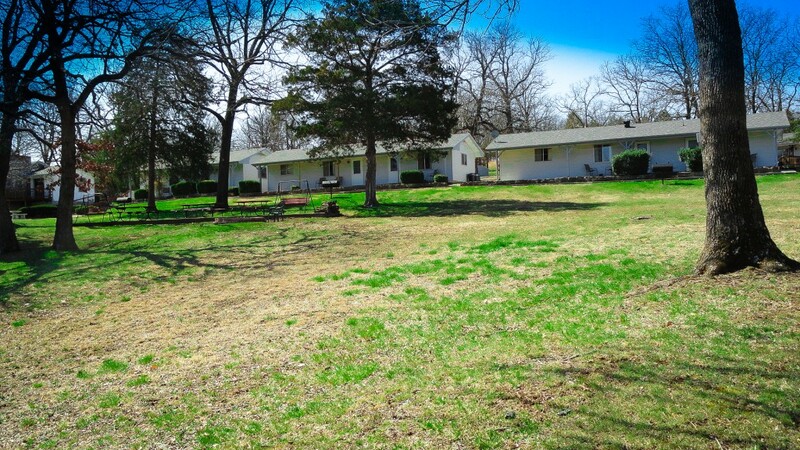 At Trace Hollow Resort, we have a variety of vacation cabin rentals for you to choose from to suit your needs. 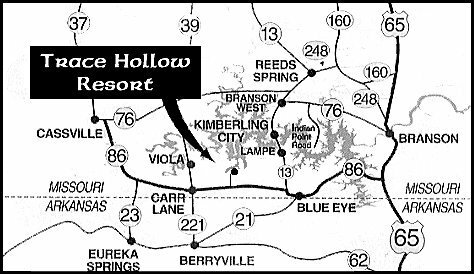 We are located on Table Rock Lake in the Ozark Mountains, just outside of Branson, Missouri. For availability during a certain date, select a cabin number below. During June, July and August we rent by the week. These units are lakefront rentals featuring carpeting, a full bath, one queen bed, one hide-a-bed, refrigerator, color TV, air conditioning, stove (no oven), chest and complete housekeeping linens and utensils. In addition, these rentals offer both a microwave oven and vanity. The double is also a lakefront unit with carpeting, a shower, two double beds, refrigerator, color TV, air conditioning, stove (no oven), and chest. Linen and utensils are also supplied. In addition, these rentals offer both a microwave oven and vanity. These cabins overlook the gentle walk to the lake and one queen bed, one double bed, and a hide-a-bed. Like the rest, they too are carpeted, include a shower, refrigerator, color TV, air conditioning and heating, stove (no oven), and chest. In addition, these rentals offer both a microwave oven and vanity. Welcome home to these cottages featuring a queen bed and a separate room with two single beds. In addition, the cottages offer a hide-a-bed, vanities, color TV, microwave, carpeting, refrigerator, shower, air conditioning and heating a stove with an oven. Now here is room to move. Three bedrooms with two bathrooms, one king sized bed, one queen bed, two twin beds and a hide-a-bed. This kitchenette features a refrigerator, stove with oven and a microwave. Also included are linens and utensils, air conditioning and heating. In addition to having two rooms with queen-sized beds and one with two double beds, this unit also has two bathrooms. There are 2 hide-a-beds in the living room. This unit overlooks the in-ground swimming pool and the lake. Full kitchen with all the amenities. *There will be a $5 additional charge per person/per day.